To complement our three large weaving swords, our wide range of pick-up sticks offer just the right tool for the task at hand. Our Beefy pick-up sticks are 1 1/2" wide and come in 20", 25", and 30" lengths; the Medium pick-up sticks are 1 1/8" wide and come in 18", 22", and 26" lengths; the Petite pick-up sticks are 7/8" wide and are available in 8", 12" and 16" lengths. All are double-pointed, made of hard maple and finished with Danish oil. Louet Victoria Footman to Treadle Connector Belt shuttle. Typically used in Card and Inkle Weaving. Belt Shuttle for Inkle Loom - 18cm / 7"
6inch fits the 15 incher Tapestry bobbins for use on all your tapestry loom, rigid heddle looms and weaving frames. Smooth lathed solid wood. 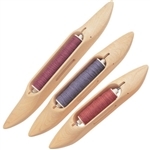 Sold in packs of 2 Perfect for tapestry looms, rigid heddle looms and weaving frames. Weave techniques quickly and easily. Weave fabrics, yarns, fibres and more with a large eye for easy threading. A must-have weaving accessory. Boat Shuttles made by Shacht in sturdy Maple wood and given a light oil finished. These are all open bottom and available in 4 sizes. 9 inch mini, 11 inch, 13 inch and 15 inch. The 9 inch and the 11 inch are slim enough to work with some Rigid Heddle applications. think of lots of other uses as well. Bench for the Klik, Kombo, David, Spring and Magic Looms. The height of the bench is 22.5". It is not adjustable. This bench is made of beech and is finished with a clear lacquer.